Don't let mildew spoil—or, worse, damage—your home's exterior. With the right tools and routine cleaning, you can banish mildew from your siding and deck, and get back to using the outdoors for relaxing, not working. Are mildew streaks tarnishing your home’s curb appeal? Houses in regions with high humidity are prone to exterior mildew, and the sooner you remove it, the better. If ignored, mildew, a whitish surface fungus, can quickly turn into a full-blown mold infestation that can damage wood and siding. While there’s no shortcut to removing exterior mildew from your home, you can get the job done a whole lot faster when you’re armed with the right tools. Then you’ll be free to sit outside with a cool drink and admire the newly pristine, rejuvenated exterior of your home. Gutters collect decaying leaves and small twigs, making them natural breeding grounds for mold and mildew. When decomposing debris is left in the gutters, it can clog downspouts and cause water to run over the edge of the gutter. When this runoff drips down your home’s siding, it spreads the mildew to other areas. Optimally, you should clean your gutters at least twice a year, once in the spring and again in the fall. But because no one wants to balance atop a wobbly ladder to scoop out the decaying accumulation, many homes don’t get the gutter-cleaning they deserve. Equipped with the HYDE PivotPro™ Outdoor Cleaning Water Wand, however, homeowners can tackle the chore with less worry. 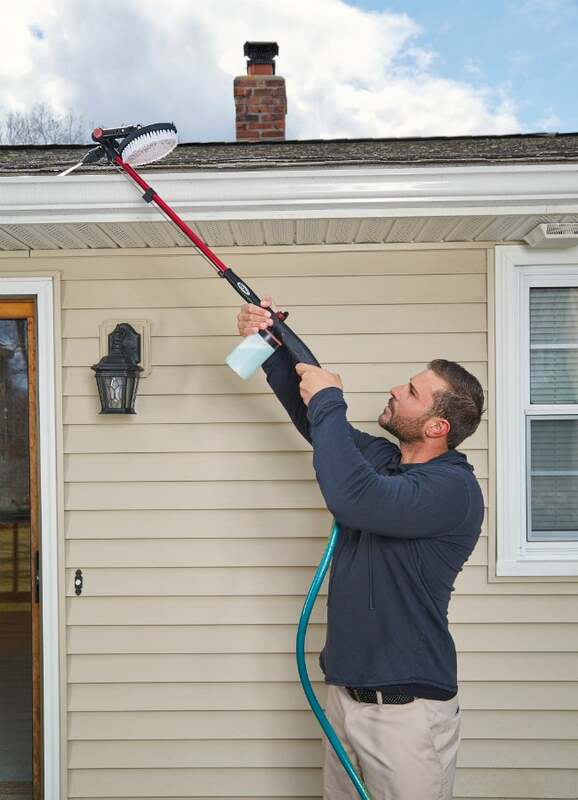 With its 46-inch wand and a pivoting head that rotates a full 135 degrees, the PivotPro easily extends up and over the gutter to blast away the leaves and debris that contribute to mildew growth. Simply connect the PivotPro to an ordinary garden hose, turn on the water at the spigot, and spray. Push or pull the handy slide grip on the wand, and you can easily rotate the pivoting head to strategically direct a jet of water into the gutters—and potentially save yourself a trip up a ladder. Like a vampire, mildew shies away from strong sunlight, so it’s most likely to develop on the north side of your house and under eaves and windowsills. All types of siding can develop mildew and mold, but wood and wood-fiber siding can see the worst damage and may be subject to rot and decay if the mildew isn’t removed. You may be tempted to try to combat mildew with a power washer, but that would be a big mistake: The high-pressure spray can blast through wood siding, peeling off paint and forcing water beneath the siding, where it can damage sheathing and insulation. Because it produces less force and offers even better precision than a standard power washer, the PivotPro is a safer and more convenient choice. 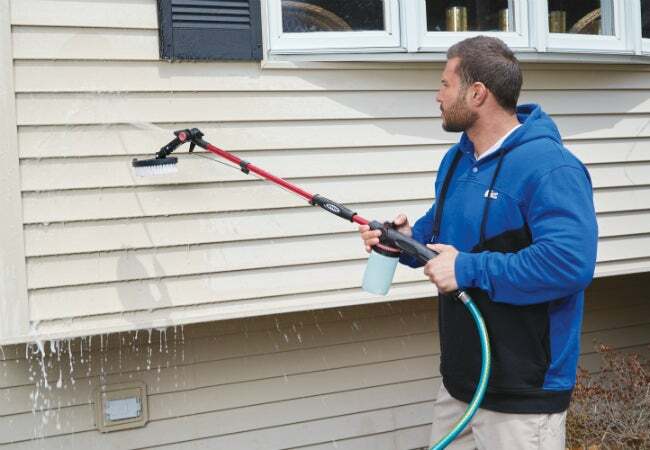 Its wand attachment delivers a robust jet of water to make cleaning easier, but you can be confident that the spray won’t overpower paint or eat through wood siding. Before you begin, fill the PivotPro’s built-in mixing reservoir with an all-purpose mold and mildew cleaning solution. Adjust the dial to regulate the water-to-cleaner ratio according to the cleanser’s instructions, and hook up the PivotPro to a garden hose attached to the nearest spigot. Spray away mildew starting at the top of an exterior wall, and work your way downward. In many cases, the mildew will spray right off. If you run into stubborn mildew accumulations, though, use the stiff adjustable brush on the end of the PivotPro wand. By flipping the brush down, you can scrub away mildew stains, both high and low, while dispensing cleaning solution at the same time. Reaching every inch of siding has never been so easy! No need to crawl behind thorny foundation plantings; PivotPro’s long wand lets you stand to the side while scrubbing behind them. Similarly, the wand also makes it easy to clean other spots that are typically just above reach, like fascia boards. 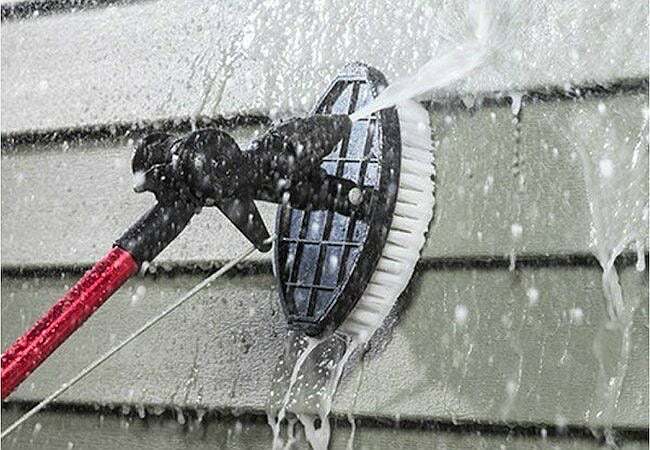 When you’re done spraying and brushing away mildew, set your cleanser-to-water ratio to zero in order to rinse off the siding with plain water. Most decks and porches will develop mildew at some point in their lifespan. During the rainy season, decking and railings can stay damp for days, setting the stage for mold and mildew growth. Covered decks, as well as those in generally shady areas, are even more susceptible to mildew because they slow down evaporation after a rain, even when the sun finally reappears from behind the clouds. To avoid further growth and possible wood rot—or, in the case of composite decking, simply to stave off unsightly surface stains—remove mildew at first sight. Old-fashioned treatments for mildew on wood decks and porches required scrubbing the surfaces down with bleach. Not only was all that elbow grease and squatting hard on the back, hands, and knees, but the bleach was damaging to the outdoor structures. Bleach breaks down the organic fibers in wood that give it strength, causing the wood to weaken and deteriorate more quickly. Instead, it’s best to clean away mold and mildew on porches and decks with water and a commercial deck-cleaning product. And with the PivotPro, once you’ve selected the right product, there’s no need to lug around a heavy bucket of cleaning solution or bend over to scrub every inch of your deck—instead, you can clean up from a comfortable standing position. Choose a warm, sunny day so your deck has plenty of time to dry after being cleaned. When the forecast is right, fill the mixing reservoir on the PivotPro with deck-cleaning solution, set the appropriate water-to-cleanser ratio, and spray the entire deck thoroughly. Use the sliding grip on the wand to swivel the pivoting head and direct spray on the underside of railings and around the back of balusters. Allow the solution to remain on the deck for 5 to 10 minutes to give it a chance to neutralize the mold and mildew. Spray again, this time using PivotPro’s adjustable brush to scrub the deck surfaces at the same time. 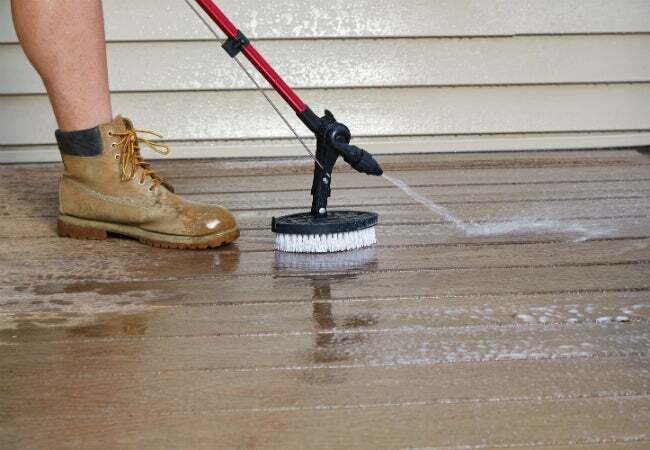 Once you’ve scrubbed away all the mildew (it should come off easily if it hasn’t been there too long), follow up by rinsing the entire deck with plain water and then let the deck dry completely. While the PivotPro makes it easier to get rid of mildew all over the exterior of the house, you still don’t want to have to clean too frequently. A little maintenance can have a big payoff: Reduce the recurrence of mildew growth on wood decks and porches by applying a deck sealer that contains mildewcide. In addition, sweep your deck often to remove bits of leaves and debris that can lodge in corners and hold moisture after a rain.